cooking, washing and watering lawns. But, water cannot be taken for granted. Irrespective of where you live, you have to conserve water using the best means possible. Every contemporary home receives water through pipes often supplied by the local water utility company. At the end of the month (or specific time frame), a bill is produced based on the readings of a water meter. Depending on how much water you are using, you will be expected to pay a certain amount of money to clear the bill. If you waste water, you will be required to channel a huge amount of money to servicing water bills. Based on this, the need to conserve water and avoid spending too much money on clearing water bills. Suppose you do not receive piped water from your local water utility company, would it make you exempt from conserving water? If you are using water pump, you will be required to pay electricity bills. Therefore, the more water you use, the more money you will spend on electricity bills. All this expressly attests to the vitality of conserving water in homes. Since both kids and adults use water, they both have to learn the best tips for conserving water. Aside from the importance of conserving water, it is time to switch to the means of conserving water in the kitchen. Adults use water for a number of things. In the kitchen, adults often use water for cooking, drinking and washing. In all these instances, a lot of water may be wasted. But, you can easily reduce the amount of water that is lost. Although you cannot eliminate losses completely, you can actually minimize them. Depending on the methods of conserving water that you are using, your saving results may be high or low. Here is a look at important ways adults can conserve water. When you enter a kitchen to drink some water, you are likely to use one of the methods indicated below. In both cases, you may waste or save a lot of water. From the fridge; nowadays, most fridges come with their own pitchers or inbuilt containers which store water. Therefore, it is quite easy to drink cool water from the fridge. But, this is associated with a lot of spillages. A lot of water may be wasted when you open the tap of the container. To avoid wasting water, you have to close the tap the moment the cup you are filling is almost full. Most importantly, you have to observe the level of the water in the cup from the start to the time it is full. Water would be lost if you open the tap and do not pay attention to the changing level of water in the cup. From the kitchen sink; if you are fetching water from one of the taps in the kitchen sink, you may waste a lot of water in various ways. In particular, you may waste water if you let the water run continuously while you are drinking water. This can happen if you are drinking more than one cup of water. 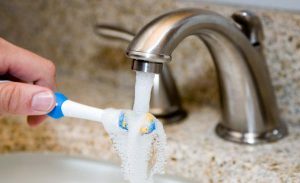 Drinking water directly from the tap is also a bad idea as it leads to many spillages. Therefore, it should be avoided. Even better, you can simply place a jug of water in the fridge. This should be your source of drinking water. When you are washing dishes, you can waste water in a number of ways. In particular, you may waste water if you rinse your dishes while the tap is running. Collect water in a bucket and dip each of the dishes in the bucket. Alternatively, you can close the sump using a cover. Let the tap run for some time until the water in the sink reaches your preferred level. Dip each of the dishes in the sink without having to open the tap. When washing food, you may waste a lot of water. To minimize the losses, you have to avoid washing food while the tap is open. Collect water in a large dish or bowl and use the water to wash the food. Cleaning sink components or sink tiles can lead to the wastage of water. You have to close the tap when rinsing the sink tiles. Collecting water in a large dish and using it for rinsing the sink and tiles is an effective way of conserving water. Thawing meet or frozen foods using water is quite common. But, it should not be done using running water. Collect water in a bowl or large dish and use the water to defrost the food. It is actually better to use a microwave than using water running from the tap. Adults are not the only ones who use the kitchen. Rather, kids also use the kitchen from time to time. Therefore, they also need to follow the water savings tips highlighted below whenever they are in the kitchen. Washing dishes; in case a kid wants to wash one or two dishes, one should avoid keeping the water running while doing so. Tell your kids to rinse dishes using stagnant water in a large dish or bowl. Alternatively, the kids can close the sump and open the tap until the water level in the sink reaches a suitable depth. Washing food; kids enjoy eating food that has just been washed. For example, they may eat fruits right after washing them using running water. But, this can lead to the loss of a significant amount of water. Always advise your kids to fill up a bowl or large dish. They can wash their fruits or any other foods.